As with several of its predecessors, there are only a couple of major cases in this short book. One involves a recently opened beauty salon being maligned by an unknown enemy. The other will determine whether the nephew who stands to inherit the farm and estate of his recently deceased uncle is actually an impostor. 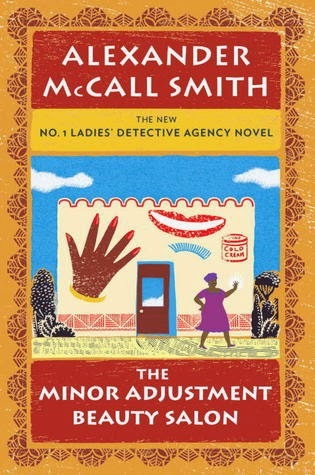 And then Mma Ramotswe's assistant - excuse me, I mean, associate detective - Mma Makutsi becomes a mother and they navigate what that will mean for the future of the detective agency and their partnership. And Mma Ramotswe's husband, the solid, reliable, and devoted Mr. J.L.B. Matekoni, decides that he must learn to be a "modern husband" in order to please Precious. (His one evening at the "Husband Course" is one of the most delightful sequences in this book.) Of course, Mma Ramotswe dispatches both her cases in good time and justice ultimately prevails, Mma Makutsi finds her footing as a new mother, and Mr. J.L.B. Matekoni continues to be the solid, reliable, and devoted husband he is. We all had to say goodbye, sooner or later, to those we loved--or they had to say goodbye to us. Those were the only two possibilities that this world allowed. But no matter how much we tried to face up to it, it never became easier. Perhaps a deliberate act of forgetting went along with forgiveness. You forgave, and then you said to yourself: Now I shall forget. Because if you did not forget, then your forgiveness would be tested, perhaps many times and in ways that you could not resist, and you might go back to anger, and to hating. The problem with being a private detective was that people expected you to provide them with a clear-cut answer to their query. Sometimes that could be done...but there were many occasions on which that simply was not possible and a more tentative answer was all that could be given--or no answer at all. Some matters remained obstinately unresolved because that was what life was like. Not all the uncertainties we faced were capable of being resolved--there were many strings left untied; there were many events that happened and could not be explained; there were many injustices that remained injustices because we could not find out who had perpetrated them, or who could rectify them. As a child she had believed that wrongs would always be righted, that somehow the world would not let the innocent suffer, but now she realised that this was not true. Old oppressors were replaced by new ones, from another distant place or from right next door. Old lies were replaced by new ones, backed up by old threats. There had been so much suffering in Africa, and nobody had done a great deal to stop it. In some places the suffering continued: through wars fought by child soldiers, crying behind their guns; through famine and disease, quick to take root in the shanty towns that perched on the edge of plenty. People waited for intervention, for rescue, but it never came--or only rarely, and then too late. Contemplating this vast human suffering, you might be tempted to shrug your shoulders, but you could not. You had to try, thought Mma Ramotswe--you had to try to sort things out for others and point them in the direction of the truth that they were so anxious to find. People were always claiming that God agreed with them even when there was little or no evidence that this was the case...No, thought Mr. J.L.B. Matekoni--people should be careful about claiming authority that they did not have. Quick read, even at the naturally slow pace of the story, but so enjoyable and soothing, so restful and comfortably familiar.